Pete is a big barrel of man, massively built, strong as an ox, with a mind that is constantly fermenting great taste ideas. He was celebrating that day because he had met with local woodlot owners who had agreed to put aside their oak and other specific hardwoods for him instead of chunking them up for firewood. He’d also got an agreement with an Amish wood mill to stockpile stave wood for him. He talked about how the wood had to carefully aged, dried and regularly turned over for three to four years to make it ready to use for barrel staves. He told me about his belief that Canadian wood would make a great oak for Canadian wines, with the concept of Total Terroir: local grapes, aged in local wood, by local winemakers. He also told me about his experiment to make mixed wood, CHOA barrels, of cherry, hickory, oak and ash. County Cider had purchased two of these barrels already to make their barrel aged iced cider. He sent me off to Black Prince winery to try their Terroir Elite Chardonnay aged in Canadian Oak that had won bronze at the Chardonnay du Monde in France. Over the intervening years, I have made a point to taste wines at wineries across the County that have been aged in Canadian Oak and the mixed wood barrels now renamed COACH barrels for Canadian oak, ash, cherry, and hickory. I’m a huge fan, as they tend to augment the flavour of the wine rather than overwhelm it. I am told by winemakers, that because they are a new product they interact differently with the wine than conventional French or American barrels, and the wines have to be closely tested and tasted to find their perfect peak or they can taste a little “planky” if left in too long. However when the winemakers took the right care, they responded well. Black Prince with their Terroir Elite wines, Karlo Estates with its CHOA Chardonnay and County Cider’s Barrel aged Ice Cider have really profited from the unique products they’ve made with these barrels. Two years ago, I ran into Pete again, he’d relocated with 66 Gilead Distillery and converted the old piggery on the property into a workshop. He was also developing a line of wine and balsamic vinegars in his COACH barrels that would be his own product. Sadly a wet spring had made most of his stored wood unusable until they had properly dried and then a period of drought made it difficult for him to get a permit to toast his barrels over his outside oven for fear of setting fire to surrounding fields. On the positive side, thanks to the connection with the distillery, he was also making contacts with other craft distilleries who were interested in his barrels and his ability to recouper old wine barrels which they wanted to use to age spirits. 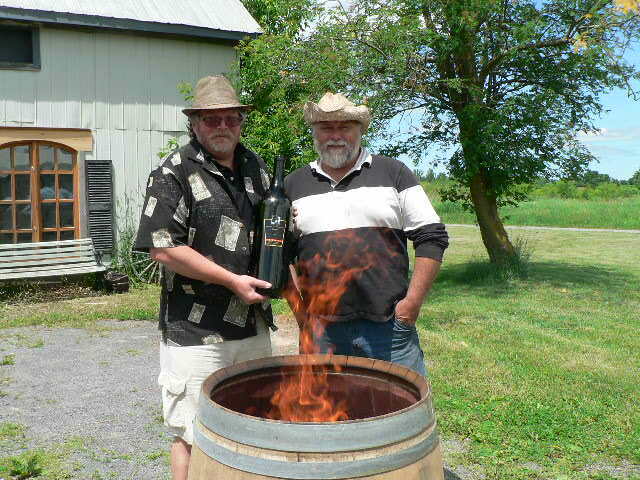 I was back in contact with Pete this month for a blog for Bay of Quinte Tourism on a Quest for Canadian Oak designing a wine tour around the wineries, distillery and cidery who sold products aged in Pete’s barrels only to discover he’d moved and reinvented his business again. 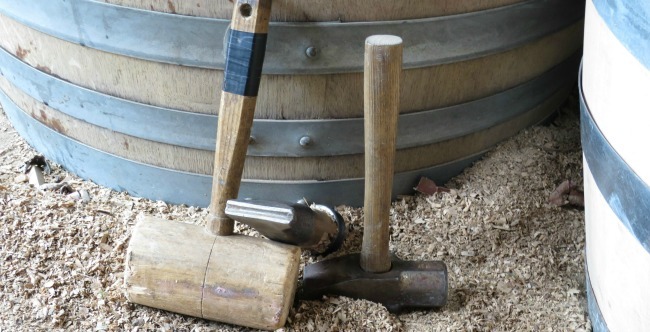 A year of family deaths and a serious work accident had made it impossible for him to keep up his barrel making to the regimen he’d set for himself without the help of an apprentice. In the meantime, requests for recoupering barrels were increasing and the gourmet vinegars were really taking off. In addition, the furnishings and gift items he was making out of dismembered barrels were also increasing in demand. 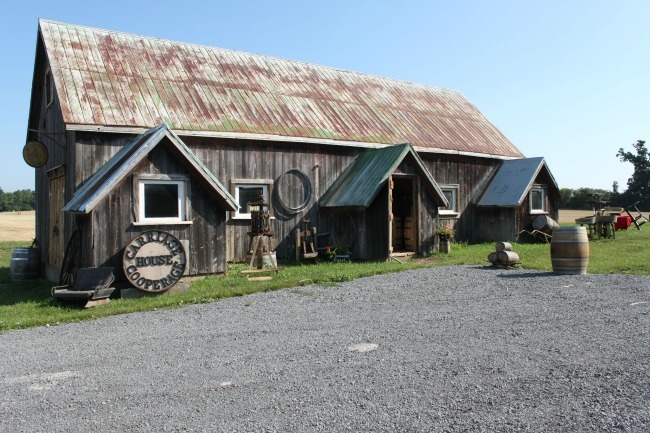 In the summer of 2014, his old friend Geoff Webb at Black Prince Winery suggested he move his business into an abandoned barn on their property in Picton and share their retail space to sell his vinegars and barrel products. The Barrel House and Canadian Vinegar Cellars was born. The weekly toasting of recoupered barrels right on the edge of town brought in residents and tourists alike and increased sales of both their products last summer and fall. Both businesses are looking to a promising tourist season to come in 2015. 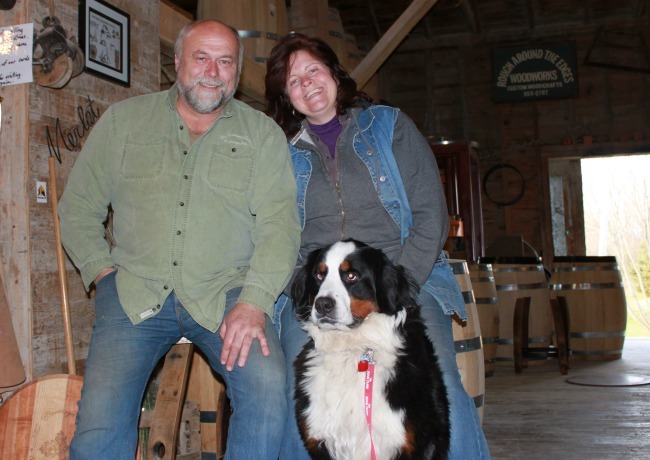 No one gets rich quick in the wine industry, and as one of only two wine barrel makers in Canada, Pete and Marla Bradford are blazing new trails. Despite setbacks that would have brought a lesser man to his knees, the ideas fermenting in Pete’s mind just keep getting better and his incredible energy and engaging personality make him one of Prince Edward County’s leading tourist attractions in his own right. Stop in at Black Prince Winery and the Barrel House at 13370 Loyalist Parkway in Picton this summer and be barreled over by the excitement. Want to learn more about Canadian Oak? Read my blog Quest for Canadian Oak on the Bay of Quinte Tourism website and plan your own wine tour. Deliciously exciting – one of your best articles. You have captured the energy and enthusiasm that is Pete. well done. We went to 66 Gillead on a PEC jaunt a couple of years ago, and met Pete. We learned about his passion for the barrel making. We wish him every success in the new location. Great article, Ron. Looking forward to a visit to Black Prince Winery and Pete Bradford’s barrels this summer.